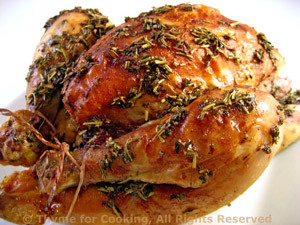 Seafood Pasta, Roast Cornish Hens, Beef Stew, are some of the main courses this week. By sautéing the shrimp and scallops in garlic butter they get a robust flavor offset by the creamy cheese sauce... If you don't normally have milk on hand use part chicken stock and part white wine- different sauce, equally good! I used spinach fettuccini. Heat stock and milk to boiling in small saucepan. Dissolve cornstarch in sherry and add to saucepan, stirring and cooking until sauce has thickened. 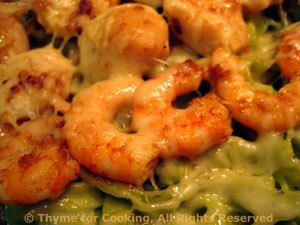 Reduce heat to low and gradually add the shredded cheese, stirring constantly. Turn off heat, and cover saucepan to keep warm until needed. Heat butter and oil in a nonstick skillet over medium-low heat. Add paprika and sauté briefly. Add garlic and sauté until golden, 2 - 3 minutes. Turn heat up to medium and add scallops and shrimp. Sauté until shrimp start to curl and both start to turn opaque, turning once. This should not take longer than 3 - 5 minutes. Remove from heat and keep warm. When pasta is done, drain well and return to cooking pan. Add sauce and toss well to coat. Put pasta in a bowl if serving immediately or a baking dish just large enough to hold everything if not. Arrange scallops and shrimp on top and sprinkle with Parmesan. 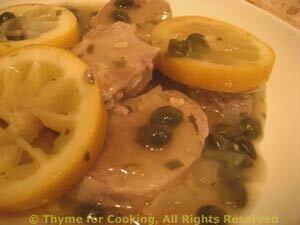 Either serve immediately or put into a warm oven (250F, 120C) for up to 15 minutes to keep hot. Sherry adds flavor notes that go well with stews. It blends well with the traditional root vegetables. You could add parsnips, turnips or celeriac, as well. This make enough for 4 servings. Cut beef into 1 1/2" (4cm) pieces. Put flour and paprika into a plastic food bag and mix well. Add beef, close bag and toss well to coat thoroughly. Heat oil in a medium pot or Dutch oven over medium-high heat. Add beef and brown on all sides. Mince garlic, add and sauté 1 minute. Add broth, sherry, tomato paste, herbs, and stir well to scrape up any browned bits. Cover and bring to a boil. 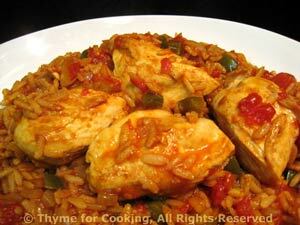 Reduce heat and simmer 30 minutes, or simmer very slowly for several hours. Start the vegetables an hour before dinner. Peel shallots and leave whole. Peel rutabaga and cut into large chunks, about, 3/4" (2cm) cubes. Peel or scrape carrots, cut into 2 inch (5cm) lengths, then quarter the long way. Cut celery in half the long way, then into 2" (5cm) lengths. Quarter the potatoes the long way then cut in half or thirds depending on size. Put potatoes into a bowl of water to prevent discoloring. Add shallots, rutabaga, carrots, celery to beef. Stir well, cover and simmer 20 minutes. Drain the potatoes and add to stew. Simmer 30 minutes longer, until vegetables are tender. 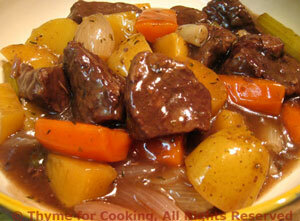 If desired, for a thicker gravy, dissolve cornstarch in beef stock. Uncover, increase heat and remove bay leaves. Add cornstarch and stir until sauce is thickened. Serve directly from pot or ladle into serving bowl. Add chili powder, onion, pepper, and garlic. Sauté for 5 minutes. Beans are a major vegetable in both France and Spain, but are normally sold plain, rarely flavored or spiced. Frying the chili powder releases more of the flavor. Chop onion, celery and pepper. Trim ham and cut into bite-size pieces. Drain the tomatoes, reserving the juice, then roughly chop. Heat oil in large, nonstick skillet over medium heat. Add chili powder and sauté 1 minute. Add onion, celery, pepper, garlic and sauté 7 - 8 minutes. 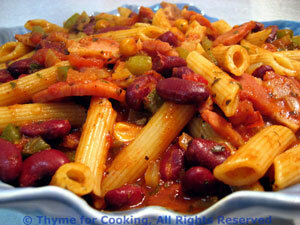 Add beans, tomatoes, juices, herbs and hot pepper sauce if using. Cover and simmer over low heat for 10 minutes. Add green chilies and simmer 5 minutes longer. Taste, adjust heat, remove bay leaves, add to pasta and toss well. Serve.